The BreastAware program is all about empowerment and education. We strive to offer our workshops free, thanks to the support of our sponsors. Workshops are delivered at your location and every program is tailored to suit the audience. If you would like to provide an educational, empowering presentation which will impact your attendees, and potentially save lives, please contact us. We have support from local schools, local businesses, breast care Nurses, Psychologists and a list of volunteers, Dieticians, Chiropractor, Body Image Consultant, Massage and Beauty Therapist, Health and Fitness Coach. 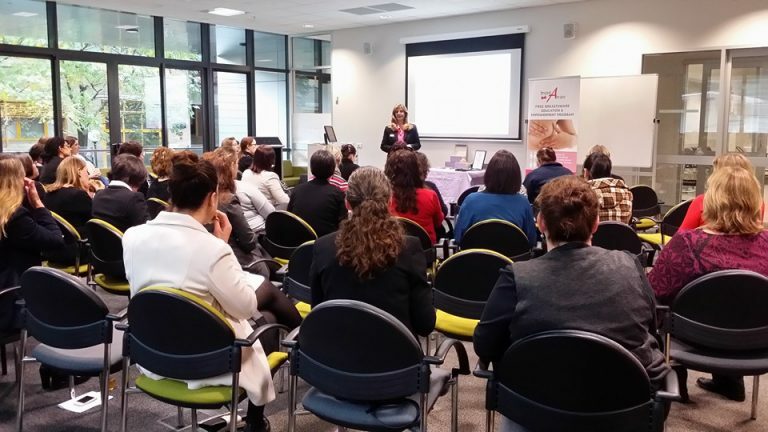 In the past year we have impacted many women (and some men) with the workshops successfully conducted. Presentation duration: delivered in 40 minutes, 2 hours or full day workshops. The BreastAware High School Program is extraordinary and vitally important. There are far too many young women who have had their breast/s removed due to breast cancer. Early detection is the key to survival. In young women it is harder to detect lumps due to the density of their breast tissue. Even with mammograms, cancer can be missed in the early stages. Learning proper self examination is vital for women between the ages of 20 and 40.
knowing what is normal for them. We will be educating them on the anatomy of the breast and how to care for their breasts. With education they will understand the changes that can occur in the breast tissue as they develop. We will explain the risks of breast cancer and give an in-depth explanation (utilizing prosthetic breast teaching aids) on how to do self breast exam (BSE) and why early detection is the key to survival. We plan to give them an understanding of the different lumps and bumps in their breast tissue that they may feel so that they are not alarmed and understand what their breasts feel like ‘normally’. Meaning they will be able to identify and understand when something is not normal for them and hence know when they need to go and get checked by the doctor. We want to change their mindset so that by the time they reach the risk age for breast cancer, they are already in the habit of breast self examination (BSE) or at least know that they should be starting to do it (BSE) by the age of 20. Once they leave school, there may not be another chance to gather together large groups of young women to educate them, so that is why we would like to get to them just before they leave school. If you would like to arrange a presentation for your group, complete the form below and a BreastAware representative will be in touch.